America’s trucks burn an enormous percentage of our total fuel, but their efficiency hasn’t improved in years. But new, simple additions to a truck’s body can have impressive effects on fuel economy. Trucks are miserable when it comes to gas mileage. America’s 2.2 million freight trucks get about six miles per gallon on average, usually with cargo. And they aren’t getting much better. While the gas mileage of cars is exploding, between 1990 and 2006, the average fuel economy of the U.S. truck fleet went from just under six mpg to… a bit more under six mpg in 2009, the Department of Transportation reported in 2009. Since trucks burn significant fraction of the fuel used in the U.S. each year (Ed: we’ve fixed these numbers to reflect that trucks use diesel, not gas), even small improvements can have a major impact. But it’s not as if truck manufactures have been sitting on their hands for the last two decades; they’re just already done a lot to get that number up to six mpg. Truck designs were given a full aerodynamic makeover years ago which improved fuel economy by more than 15% compared to their 1980s predecessors. efficiency out of America’s freight shipping fleet. 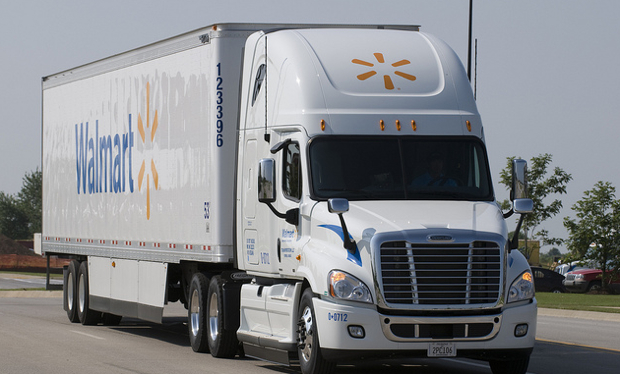 The top three trailer makers, Wabash, Utility, and Great Dane, now provide trailer side skirts–panels along the bottom of the trailer which reduce wind resistance and improve mileage, like those on the Walmart truck pictured here–as factory installed options. ATDyanmics manufactures the TrailerTail, which smoothes out the airflow around the back of the trailers, and they’ve reportedly sold about 5,000 (Ed: This number has been corrected from 100,000) in the last 12 months alone. tractor or cabin, other than that of driver habits,” wrote Babur Ozden, chief operating officer of ATDynamics which makes trailer aerodynamic devices, by email. Ozden sees most of the trucking fleet, eventually, adopting the new technology. New durable materials, state and federal mandates, and a new generation of drivers and fleet owners interested in every possible competitive advantage, both financial and environmental, just makes business sense.